FotoBella is now carrying Trinkets and Charms that coordinate with many of our beautiful bundles! Recently, esteemed FotoBella Design Team member Jeri Vann showed us some awesome "Anchor" earrings made with charms from her collection. She inspired me to give it a try! Today I am working with the "Tea Garden" Collection Pack by Basic Grey. This gorgeous paper collection is so pretty and features beautiful flowers in lovely summer colors. 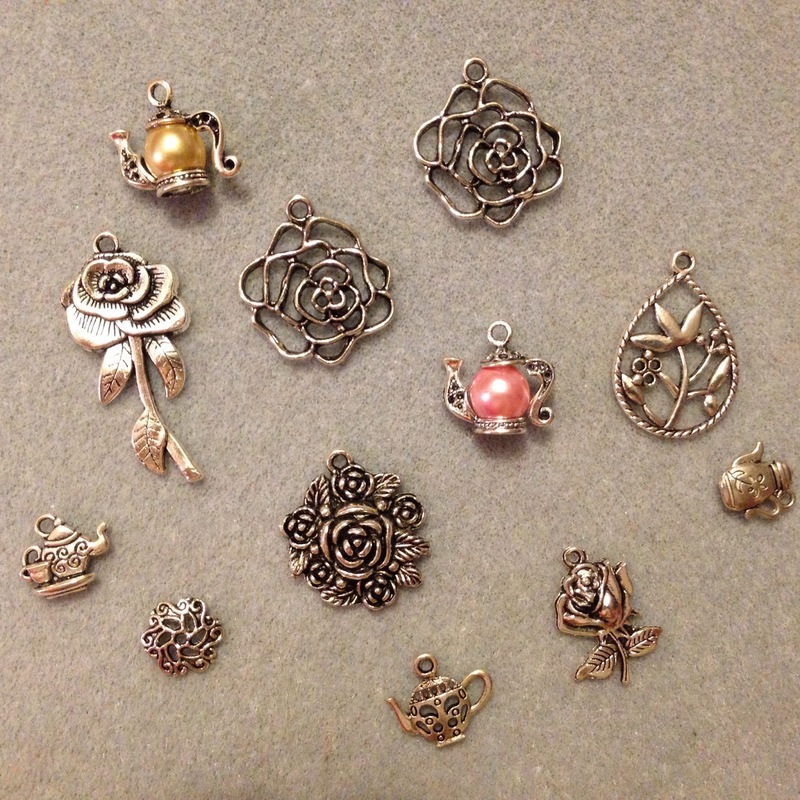 The "Tea and Rose Charms" are so pretty! The pack contains variations of teapots and flowers, lilies and roses. Each charm varies in size, and the color is faux-silver and very shiny! You don't have to be a jewelry maker to create pretty embellishments and other projects with these versatile charms! Today I am going to show you a few ways you can use these charms and how to make a few projects! 9. Hardware such as earring wires, clasps, lobster clasps, etc. Once you have your supplies gathered you are ready to begin! Our first project is earrings. 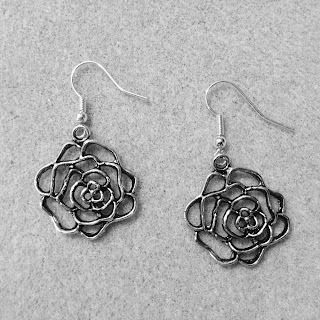 You can see that all you will need for earrings are the two rose charms, two jump rings and two earring wires. 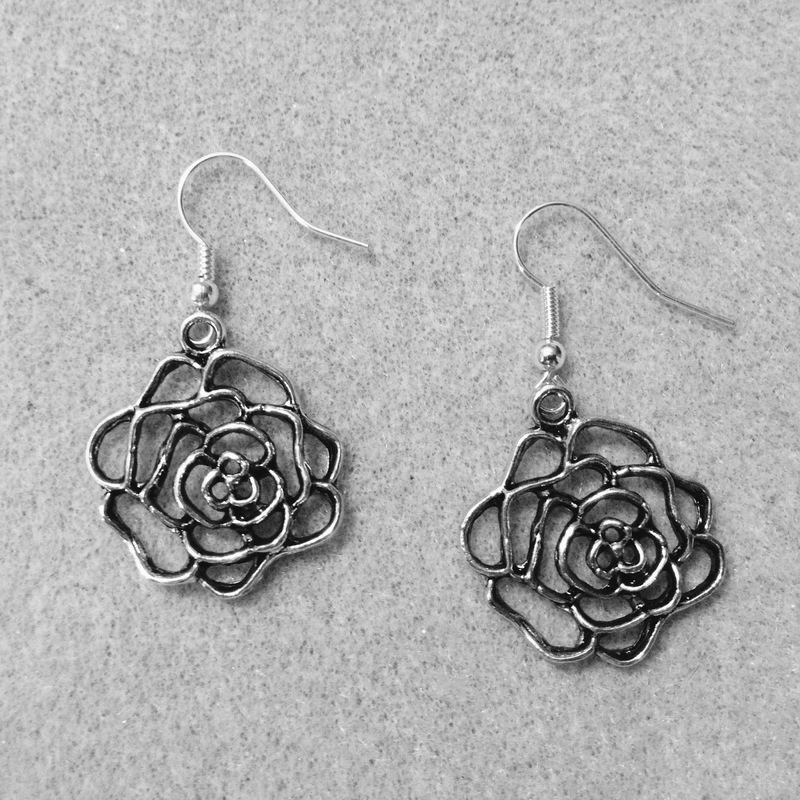 Attach the rose charms to the earring wires with a jump ring. That's it! Done! You can make them more elaborate if you desire, like the ones shown below! Our next project is a charm bracelet. 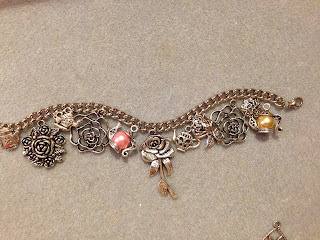 Lay out your charms in the order you wish them to appear on your bracelet. Measure your wrist. Cut a chain the appropriate length for your bracelet and attach the clasps on each end. Attach desired charms to the bracelet with Jump rings. I start in the middle and work to each end, that way it is easier to see how much room you will need. Easy-peasy! I found little book markers at a local jewelry supply store. Using a head pin, make a little dangle charm by placing the desired beads and bead caps on the head pin, then wire wrap it at the top to create a loop. Using a jump ring, attach a charm to the loop at the end of the head pin. You now have a pretty book marker. These are fast, easy and beautiful! Great for gifts or stocking stuffers! 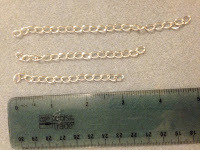 Starting with 12 inches of chain, cut the chain into 3 pieces varying in length.. I usually do one at 5 inches, 4 inches and 3 inches. Attach your longest chain to the Lobster clasp. 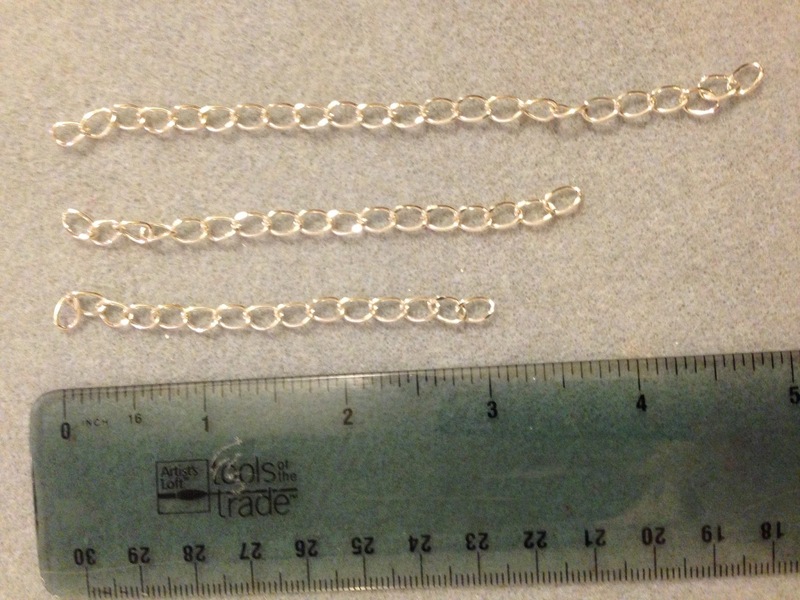 Also attach the medium sized chain to the lobster clasp, then attach the shortest chain to the medium length chain. This is the start of your charm. Set this aside. You are now ready to create some charms. 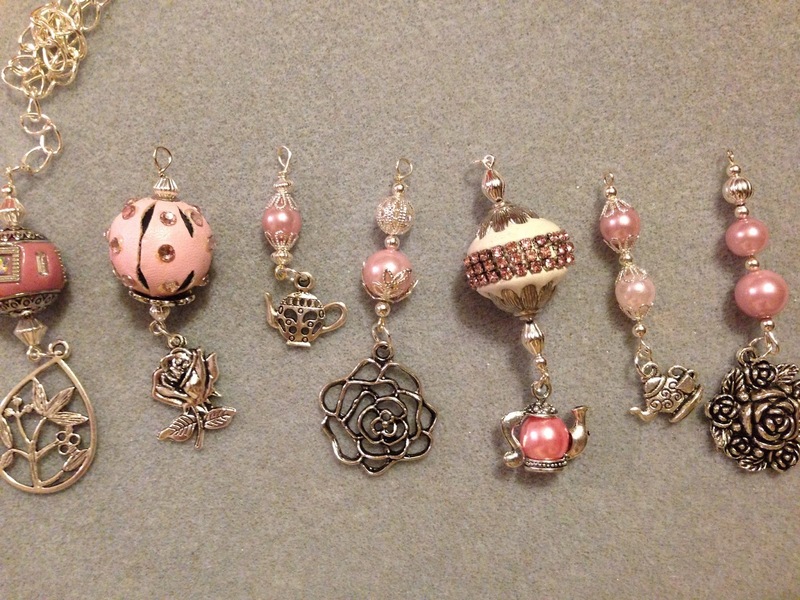 Using the headpin, add beads to create small charms. You can use the bead caps, fillers and various beads to create unique charms. Add a FotoBella charm to the end of each of your bead charms by hanging it to the loop with a jump ring. Use every charm. Starting with the largest charm, begin adding your charms to the chain. I usually put the largest one on the bottom of the longest chain, but you can use your own taste to determine the placement. Continue adding your charms until you have added them all. Here are some of the dangle charms I made. Hold your charm up by the lobster clasp...does it look balanced? You may have to make adjustments at this point but it's easy to move charms around, just undo the jump ring and re-attach it! Once you are satisfied with the placement, you may want to tie a ribbon or lace tie at the top of the charm. I like to hang mine on decorative hangers and display them in my home. This one graces my dressing table tray! Charms are versatile and easy to use. 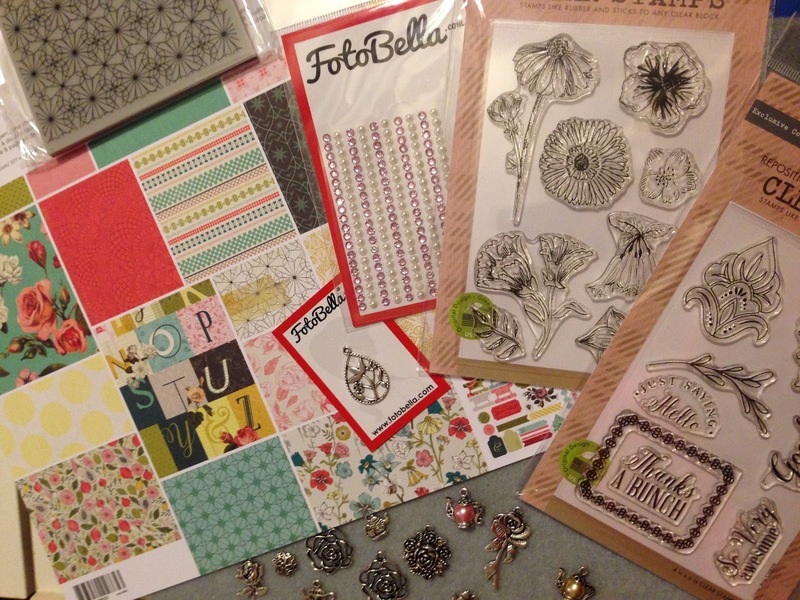 At only around five dollars, FotoBella makes it easy and affordable to create pretty embellishments or jewelry with these beautiful charm packs available for many of our paper collections, or you may simply purchase them on their own! Click on the link HERE to see all our beautiful charm packs! I hope you do! They are so much FUN! Please do give it a try! I think you'll find making earrings and bracelets quite easy and lots of fun ! Beautiful! Loved seeing a tutorial. And love that tussie mussie! Patty, that is an altered perfume bottle! It looks lovely all of it. I love to make my own jewelry have been doing it for years. But I do love to work with the small beads like miyuki rocailles. You only have to click at the end of this post to find the teapots! Easy! I'll warn you, once you make a chunky charm you're hooked on them for life! Beautiful charms!!! I must see what others you have. Thank you for this tutorial. Hope you have a blessed day. Brandy, we have several pages filled with really cute charms and more to come in the next few weeks! Thank you for your kind words Michelle, I appreciate it very much and I'm humbled by your compliments! Hugs! So happy you are here Sandra! Thanks for the shout-out ReNae!! I love what you have created!! Thank you for always inspiring me Jeri! Thank you Alissa! The charms really are beautiful! It's hard to believe they're under five dollars! Hi ReNae, this is absolutely beautiful. Are all the charms used in this chunky charm project available for purchase? ie. the pink one with the crystals on it and the rose hanging? Cathy, As far as I know they are still in stock. Click on the link above and it will take you to the page where you will find ALL our charm sets!